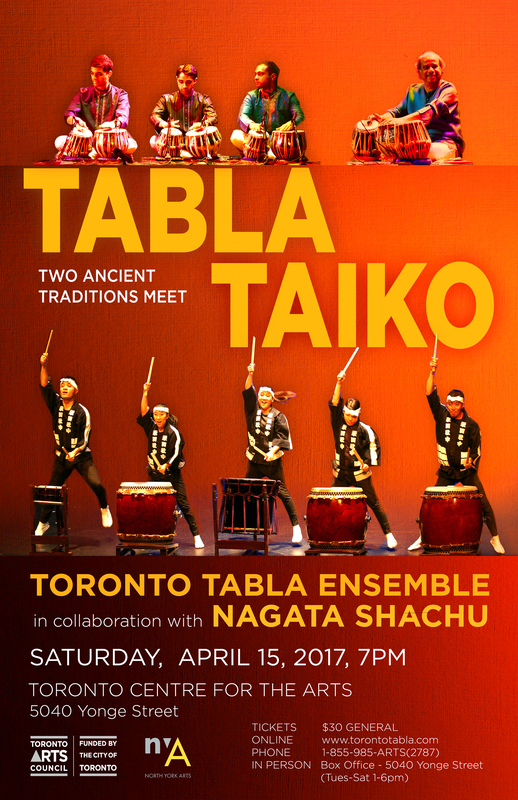 Join Toronto Tabla Ensemble and Nagata Shachu on April 15th, 2017 for an evening of scintillating rhythms at Toronto Centre for the Arts. Both Toronto-based ensembles have contributed immensely to the World Music scene in Canada, raising the profiles of Indian and Japanese music respectively over the last 25 years. This concert will feature compositions by the two ensembles’ maestros, Ritesh Das and Kiyoshi Nagata, who have created new works that maintain each tradition’s form to create a truly novel sound. The concert will feature percussive traditions whose roots trace back thousands of years with the ultimate goal of bringing communities together in a celebration of Canadian heritage during the country’s 150th year. Both Das and Nagata were among the pioneers of cross-cultural music collaboration in Toronto with their respective ensembles in the early 1990’s. Rejoining forces in 2015, they stunned audiences with a sold out concert at the Harbourfront Centre. One of their newly composed pieces, Sare Panch (Five-and-a-Half), will feature on the upcoming Toronto Tabla Ensemble album Bhumika (Sanskrit word for Earth) to be released in Fall 2017. Another milestone to be celebrated on the night is the launch of a partnership between Toronto Tabla Ensemble and co-presenter North York Arts. The two arts organizations aim to continue producing unique presentations to foster artistic development in the North York community. After receiving the 2016 Roy Thomson Hall Award from the Toronto Arts Foundation, Toronto Tabla Ensemble’s artistic director Ritesh Das said “2017 is an exciting year and we are always looking to raise the bar”. The Ensemble’s 2017 concert season will also feature an album release concert and a collaboration with modern dance group Kaeja d’Dance at the Harbourfront Centre.